Like many cities around the world, the Swiss capital, Bern, has seen a stunning amount of new development and construction in recent years. A vast number of new buildings have been erected, while existing ones have been refurbished or transformed for new uses. Among the numerous architecture firms whose projects have been realized in Bern are Diener and Diener, Atelier 5, Burkhalter Sumi, and Graber Pulver. In addition, the internationally celebrated architects Renzo Piano and Daniel Libeskind have contributed new landmark buildings. This handy pocket guide highlights the most important and interesting of those new buildings, ranging from the historic town center to the suburbs. The eighty entries feature short critical essays about each building, accompanied by specially commissioned photographs, floor plans and section views, and boxes of key facts and figures. 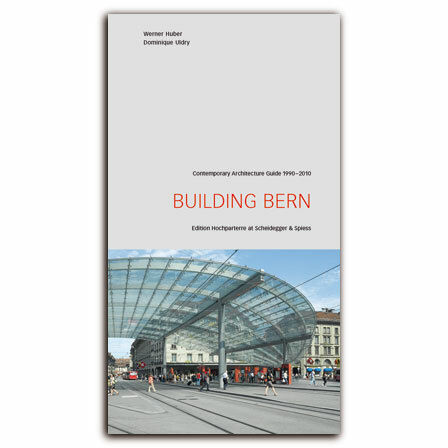 A separate section focuses on a selection of earlier twentieth-century buildings now regarded as classics, and an introductory essay links contemporary architectural achievements with the long history of building in Bern. The result is a book that celebrates the city’s admirable melding of old and new, making Building Bern the perfect companion for a trip to Switzerland’s capital. With an introduction by Werner Huber and object descriptions by Federico Billeter, Roderick Hönig, Werner Huber, Manuel Joss, Jenny Keller, Rahel Marti, Benedikt Loderer, Sue Lüthi,, Caspar Schärer, Robert Walker, and Lukas Zollinger.